To protect life and property from fire and other peril, To give our customers maximum value for their investment, and To contribute as much as possible to the welfare and well being of our community in the process. The Macon-Bibb County Fire Department has accomplished much in the past 125 years, but with progressive leaders, brave personnel and supportive citizens, the next 100 years will be even better. We train harder that we may serve better and it is with dedication we serve! Responsible for orientation and training of new personnel as well as continuing education and training for line personnel. New personnel go through 12 weeks of training (480 hours) in which they become certified First Responders and Georgia State certified firefighters. Hands-on training in several rescue techniques, such as: High Angle Rescue, Confined Space, Vehicle Extrication and AED Certification. Coordinate the burning of depilated housing. Conduct Emergency Medical Technical (EMT) training classes. Coordinate Smoke Detector Grants and programs in conjunction with Georgia Division of Public Health. Coordinate community CPR through classes held in conjunction with American Red Cross. Program which includes visiting local Personal Care Homes, Nursing Homes and Housing Authority residents to teach and promote fire safety. The Macon-Bibb County Fire Department provides full-time, paid, professional fire protection and educational services for the City of Macon and Bibb County. This department has earned the rating of “Class 1” in the City of Macon and a“Class 3” rating in Bibb County by the Insurance Services Organization (I.S.O.). There are less than 50 fire departments with this rating in the nation. This rating allows for very low homeowner insurance premiums for city and county residents. This department is earnestly working with public and private partnerships to raise funds to purchase Thermal Imaging Cameras. This device is the latest in search and rescue technology and has saved hundreds of lives since implemented in the fire service. The main purpose of this division is to save lives and property through education and prevention. Through this division, Fire Inspectors enforce codes that relate to life and fire safety. Macon and Bibb County has adopted the standard fire prevention codes of the Southern Building Code Congress International, and all local codes which reference the NFPA standards and ordinances. Inspect all businesses at least once per year, enforcing all codes. Check all gasoline and L.P. gas tank installations. Check all new business license applications. Make chimney inspections and recommendations. Check all new construction plans for water supply, access and other important information. Hold fire drills and fire safety programs throughout the county — schools, hospitals, etc. Answer complaints in reference to lots, vacant houses, etc. Make voluntary home inspections upon request. Work closely with other enforcement agencies throughout the city and county. Set occupant loads in all public place of assembly. Set up fire brigades in industry and health care facilities, and hold fire evacuation programs. Work closely with architects and engineers in relation to building construction and water supply. Attend community meetings with clubs, groups, etc., that are concerned with fire safety. Issue permits for burning, blasting and fireworks. Below is a list of all of our fire stations. 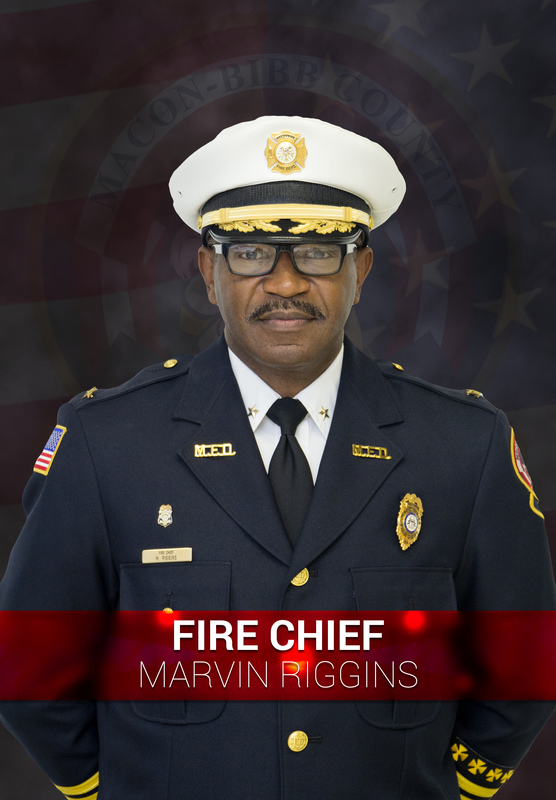 Chief Marvin Riggins, named Fire Chief for the Macon-Bibb County Fire Department, began his career with the department in 1979, rising through the ranks as a Private, Sergeant, Lieutenant, and Chief of Training. In June 2000, he was appointed Assistant Fire Chief, and in April 2008, he was appointed Fire Chief by Mayor Robert Reichert. Chief Riggins’ professional goal is to ensure the citizens of Macon-Bibb County continue to enjoy the absolute best in fire and emergency services protection. His personal goal is to be a blessing to his family, and community. During his career, Chief Riggins has been recognized numerous times, including being named Firefighter of the Year three times and receiving the Macon Optimist Community Service Award, the Shields Club Award, Paramedic of the Year Award, and the Georgia Association of Fire Chiefs President Award. A member of “Who’s Who in Leadership of America,” Chief Riggins volunteers with the Boys and Girls Club of Central Georgia and at the Booker T. Washington Center. He is a longtime advocate and now Board Member of the American Cancer Society of Central Georgia and Board Member of United Way of Central Georgia. He is also a member of the Epsilon Beta Lambda Inc. Alpha Phi Alpha Chapter of Macon, Georgia. Chief Riggins is a graduate of Central Georgia Technical College (Paramedic Technology), Macon State College (Public Management), and Georgia College and State University (Political Science). He also earned his Master’s Degree in Governmental Public Administration from Georgia College and State University. Chief Riggins was born in Macon, Georgia, March 1961, and is a proud graduate of Twiggs County High School Class of 1979. He is married to the former Gloria Ann Stephens; they have a daughter, 20-year-old Keenya Monique. They are faithful members of the Union Baptist Church of Macon.